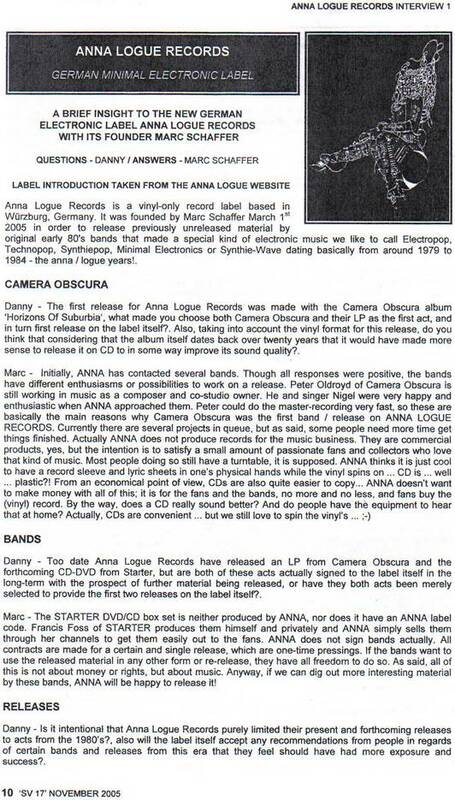 ANNA LOGUE RECORDS is an independent record label based in Germany. It was founded by Marc Schaffer in March 2005 in order to release previously unreleased material by original early 80's bands that made a special kind of electronic music generally described as "Electropop", "Technopop", "Synthiepop", "Minimal Electronics" or "Cold Wave" spanning a period from 1979 to 1984 - the anna/logue years! The label's aim is not to make money. This is about passion for this music which has sweetened so many hours over many years and will hopefully do so in the future as well. In order to achieve this ANNA LOGUE RECORDS is trying to manufacture and offer high quality products. Therefore vinyls (and where applicable CDs) are currently professionally pressed by a renowned pressing plant in the Netherlands. Products are planned and put into action from the view of the fan and collector therefore providing as many relevant information as possible and packaging the product as attractive and conserving as possible. 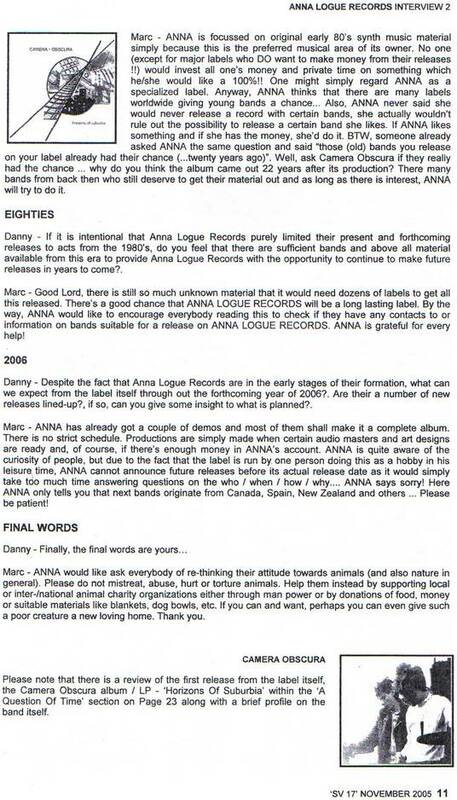 For further remarks please read the interview with Marc led via e-mail by Danny King for his Synthpop fanzine Synthetic Vision, originally printed in Issue #17, Nov. 2005. Interview depicted on this web site by courtesy of Danny King/Synthetic Vision (Part1 / Part2). In general please do never send any money until you have received the invoice sent as a pdf-file from Anna Logue Records. 1. Payment via bank transfer: bank transfers within the European Union are charge-free when you do a SWIFT-bank-transfer (which means you use IBAN and BIC). If you transfer from non-EU countries a bank fee will apply. 2. Payment via PayPal: if you want to pay via PayPal, please ask for the email-address where to send the money to. A fee will apply which will be calculated upon the current PayPal charges. Anna Logue Records is shipping items ONLY after receiving full payment - there are no exceptions. Please do not order if you cannot or intend not to pay.